To see a list of possible and currently-selected Projects and Teams, simply click on the selector. If you need to see data from other Projects and Teams, select them in this opened popup and click “Set”. When you select your own set of projects and teams, the selector will be highlighted, as shown below. Whenever you create a view, make sure you set an appropriate Projects and Teams selection so that other users see consistent data (if the view isn’t private). When you are in View Setup mode, you will see the same data that other users see in the view. 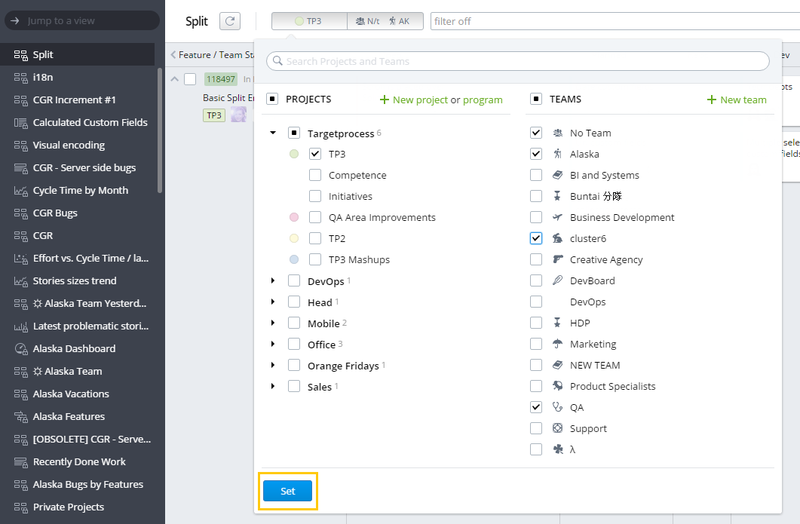 Your personal Projects-Teams selection and filters are disabled in setup mode. If a view’s creator has not set a default Projects-Teams selection, then the view will have its selection set automatically for each user. In such cases, the revert button will not work because there is no predefined Projects-Teams selection to revert to. Sometimes, you may need to open a view and have it display data from the Projects and Teams that you currently have selected. And you don’t want to select projects and teams once again. 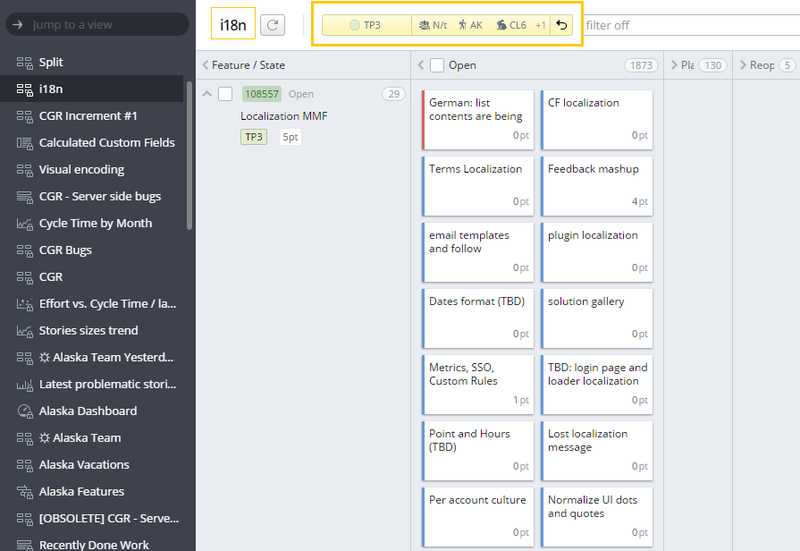 Or even more, you want to open few views with already selected projects and teams. It could be tricky to open every interested view and set the same set of projects and teams in the selector to see needed data. To make such scenarios work, you can do the following: Select the Projects and Teams you wish to see using the selector at the top of the view (this selection won’t override the predefined Projects and Teams for this view). The new selection is applied and you can explore the view’s data. To open another view using the selection you just applied, you can hold the ‘Alt’ key and click on the new view in the left menu. Voila, the view is opened with the previously selected Projects and Teams. You can repeat these steps any time you need and navigate through the views with once selected Projects and Teams with no need to set them up on every view. Since Targetprocess v3.12.1 in the Projects-Teams selector, you can find a small option that allows you to see and select Teams that are currently assigned to a Project. 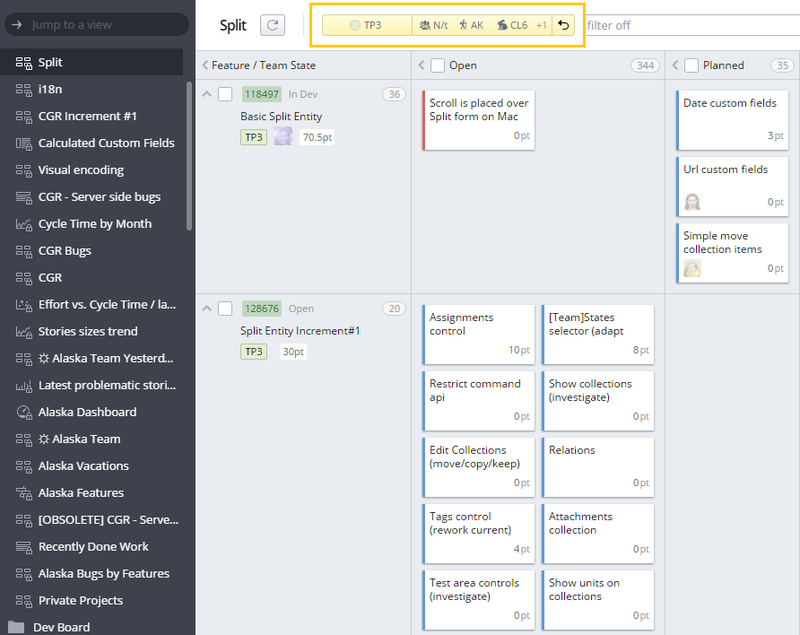 The same works in the opposite direction: you can select the Projects that your Team is assigned to at the moment. In some sophisticated cases, the capabilities of the selector do not fit your needs. Should this happen, you're welcome to try using one of the Advanced Filters by assigned Project and Team.